Look, straight up, I know this is a really silly joke and I probably should just stick to my good old smutty jokes, but damn it I just couldn’t help myself. I got this idea last week whilst I was waiting at an airport and I noticed someone charging their phone on a wall outlet and it made me think. 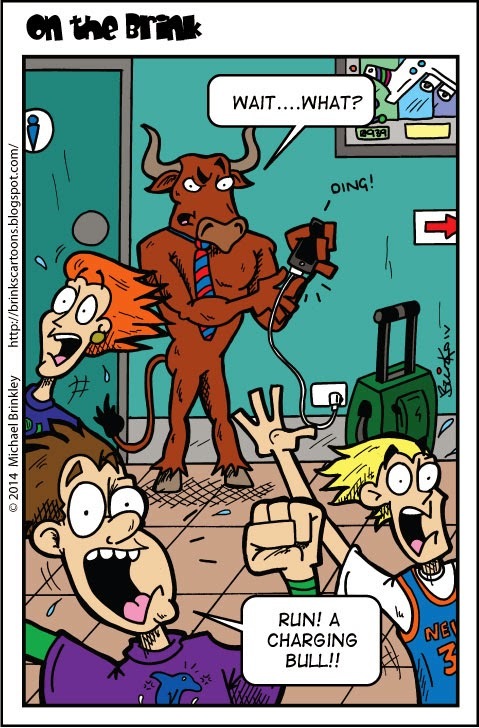 I remember awhile back I had the idea of a charging bull using a credit card to ‘charge’ something, but I looked it up and I wasn’t the only one to have this idea so I shelved it. Not sure what made me think of it in relation to someone charging a phone at an airport, but once again it’s my old method of combining 2 seemingly useless ideas into one useful one. I do remember thinking of this idea and immediately thought “Nah, that’s way to stupid and idea”, but I paused and I think because that was my initial thought that I just had to do it then. I mean, why the hell not? That and I did actually enjoy drawing this one too, so in the end if no on likes it I don’t care, I do and that’s all that should matter in the end really. Anyway enough defending myself, I hope someone other than me likes it, see you next time!